VATICAN CITY (CNS) — Pope Benedict XVI called on people to never be satisfied with their earthly achievements because true happiness entails seeking out the greater good. He said people should “not be discouraged by fatigue or by obstacles born of our sins,” because striving for the greater good is demanding and cannot be built or provided by mere human effort. During his general audience talk to some 20,000 pilgrims gathered in St. Peter’ s Square Nov. 7, the pope spoke about “the mysterious desire for God,” which lies deep in every human heart. People always strive for happiness and a well-being that is “often far from spiritual,” and yet they are also aware there still remains a deeper yearning for something that could truly satisfy their “restless heart,” he said. “Every wish that arises in the human heart is echoed by a fundamental desire that is never fully satisfied,” he said. True love pushes people to think beyond themselves, to be at the service of the other up to the point of self-sacrifice, he said. 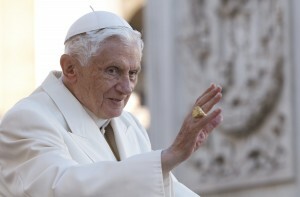 Pope Benedict said the church should create a “pedagogy of desire” for people of faith and for those who do not believe in God and as a way to open them up to the transcendent.This “pedagogy” would teach or remind people to enjoy “the authentic joys of life,” such as family, friendship, helping others, solidarity with those in need and the love for learning, art and the beauty of nature, the pope said. Not all pleasures are equal; some things eventually leave behind disappointment, bitterness, dissatisfaction or emptiness, he said. People should appreciate those things that leave behind “a positive mark, ease the soul and make us more active and generous.” Such authentic enjoyments also create “effective antibodies against the trivialization and banality so present today,” he said. Learning to rediscover authentic pleasures can rescue people from “the mediocrity in which they may find themselves ensnared” and it can help people ignore or reject all the things that seem attractive on the surface, but underneath “are dull or bring about addiction and not freedom,” the pope said. Nothing can extinguish the innate desire for and ability to recognize the true good, not even after following the wrong path in life or when trapped in an “artificial paradise” or in the darkest depths of sin, he said. God has made that ability innate in everyone and it is always open to redemption and the gift of his grace, the pope said.